I have been down working around Aberfeldy over the last 4 days on a Duke of Edinburgh Silver training trip. Sunday was a foul day with non stop rain and a fairly cold and depressed group once camp was reached! I was a little gloomy myself and the forecast was predicting much the same for the next few days! However when I woke on Monday morning it was dry and then over the next 3 days it just progressively got better, till come Wednesday afternoon we were all a little pink! My team did really well developing there navigation skills and all the other skills needed to be out in the wilderness for 4 days and 3 nights. They were also excellent company so all in all it was a great 4 days. I now have a little time off that is going to be filled by heading south to the Lakes for a stag do and some mountain biking. Guy if you are reading this 'good luck'! I was at Cummingston yesterday with Martin, Kirstin and John. Martin is preparing for his MIA assessment and had asked for some input on his teaching rock climbing. To help with this Kirstin and John had agreed to come along and act as mock clients for the day. We spent the day climbing routes looking at teaching points, session structures, the pace of the day, teaching lead climbing and generally enjoying the dry weather. I now have a few days off before heading down to Loch Tay area to work for Fettes College for a few days. Will hopefully be out on my mountain bike and climbing, however I should be doing my tax return from last year!!! A little damp on the way down! ﻿ ﻿ After a few days at home were I managed to get out on the bike for a first time in a while with Bill I was back across to Glen Coe on Saturday for some scrambling. I was out with Steve abd Caroline, Steve is preparing for his MIA assessment and wanted some input on his scrambling and general mountain day. The forecast was to be dry in the morning and wet in the afternoon, which was spot on as at 12.30pm it started to rain and by the time I got back to the van at 5pm I was soaked! We spent on the Zig Zags looking at the use of the rope in ascent and descent on broken scrambley terrain, topics covered were short roping, ledging, short pitches, lowers and managing 2 people on the end of one rope. ﻿﻿﻿I was working for Glasgow Academy last week on a Gold D of E training trip. The route started by crossing the Corran Ferry and then heading north up the loch side and along Cona Glen to camp at the end of the Glen on Day 1. Day 2 had us heading North past Glen Finnan and to a camp just North of Streap in Gleann Cuirnean. The weather was nice over the first two days with just the old shower, however this changed on day 3 with continual drizzle for the day as we headed to Glen Dessarry and down to Sourlies. By the time we got to the bothy were were all fairly damp so it was nice to use the bothy to cook and dry out in! Day for had us start early to head up and over the Mam Meadail col and down to Inverie for lunch in the Old Forge Inn. It was then a hope on a fast rib to head back to Mallaig and lift back to Corran to collect my car. A great few days through some wild areas. The team were excellent and should have no problems with their qualifying trip in the future. It was day 3 of the ML Assessment today, and day 1 of the 3 day exped! As all the team had done their training exped on the main Cairngorm plateau Jon and Mark decided to head east and start from the Lecht area with the aim of walking back to Glenmore Lodge. We headed west from the Ski Centre staying high and taking in all the summits on the broad ridge line. Each member of the team took turns at navigating and generally leading and at our lunch stop we heard a few general interest talks on the mountains. Once at 'The Eag' I said goodbye to Mark's team and started heading back to my van which was at the Lecht via a short stop to chat with Jon and his team. A great few days and good to see how other instructors structure their assessment days. I have a few days off before heading across to the west coast to join Glasgow Academy on a Gold Duke of Edinburgh training trip. I was out on day 2 of the Summer ML assessment today with Jon and his team. The aim today was to look at managing a group through steep broken ground with and without the use of a rope. It was a little damp and windy when we left the ski car park today and headed into Sneachda! After a few nav legs on the way into the corrie we headed up towards Twin Ribs with the team taking it in turns to lead the group and pick a line up on to the ridge. From here we headed up on to the Plateau with various detours off the sides of the ridge. Once on the top it was time for some more navigation before heading back down the goat track and back to the bus. A good day out even if the weather was not great, felt cold for June! Fingers crossed it is a little warmer tomorrow. I am at Glenmore Lodge till Wednesday this week shadowing a Summer ML Assessment as part of my CPD. Although I have worked on these courses before it is always in isolation and so it is great to be able to see how other instructors run assessment days. Today I was with Mark and his group and we headed from the top ski car park towards the Allt Coire an t-Sneachda and then followed this back down towards Glenmore Lodge. On the way we looked at some navigation, burn and river crossings, emergency issues plus some environmental topics. Although a chilly day it has been dry in the Cairngorms with light winds. Sorry no photos as I forgot my camera. For my final day with John and Lucy we headed to Sgurr a Chaorachain and the Classic Rock route of Cioch Nose. We parked at the Bealach na Ba car park and walked down to the route, always a novel way to approach a mountain rock climb. The climbing is great with solid rock and great protection mainly in the form of nuts, it was still wet though in areas some of the cracks on pitch one and the chimney on pitch two being particularly slimy! Still we had a great day with the classic pitch 3 being a great and airy as ever. After getting to the top we carried on along the ridge with another two pitches of V Diff and then lots of scrambling to get us back to the summit and a short walk down hill to the cars. A great way to finish of a lovely weeks climbing with Lucy and John, thanks to them for there company over the week. I have the weekend off before heading over the Glenmore Lodge for the start of next week. With the weather due to cheer up on the West coast during the morning John, Lucy and I headed over to Shieldaig on Thursday morning. It had been damp and windy over night but after a relaxed start and a coffee in the wee coffee shop in Shieldaig the sun started to come out and dry everything off. By 11am the crag at Ardheslaig was nice and dry so we headed there to build on the leading that Lucy and John had done the day before. Ardheslaig is a lovely little crag about 5mins form the road and around 35m high of solid gneiss with great friction, it has a range of routes from Diff to VS and some of the easier ones can be split into 2 pitches to create a great intro to multi pitch climbing. Lucy and John between themlead 6 pitches with me along side to take photos and add a little help when needed. 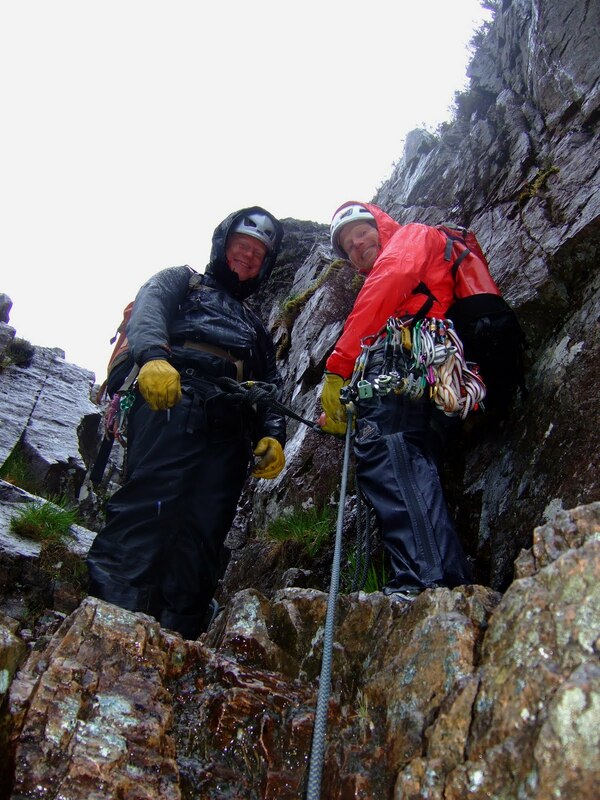 After this we had a short discussion on ropework for scrambling and how to take coils before heading around to Applecross and a lovely dinner at the pub there! With a windy forecast for the mountains today Lucy, John and I headed to Cummingston. The plan for the day was to get them on the sharp end leading some routes. I lead a few routes for us to warm up with and as we were doing this we discussed tactics and preparing to lead routes, we then looked at some bouldering to coach some movement skills. After all of this Lucy and John had a go at leading a few routes which they did with great style. Although windy it stayed dry until just after 4pm and we had another great day. We are going to head up towards Applecross tomorrow with the hope of doing some routes up around there.